​Survival and protection witchery is required when severe weather is in the forecast. Living where I do, I’ve developed an extensive repertoire of ways to prepare, protect and use storm energy. I’ve included a petition of protection to Hekate Brimo that can be used for all types of stormy weather. With the remnants of a tropical storm descending upon my little piece of the world, I’m reminded that the season of severe weather is underway. Fall brings with her many emotional gifts, including the transformative power of raging winds and flooding rains. Survival and protection witchery is in order when hurricanes and blizzards come my way. I love absorbing severe weather energy, but there are times when shielding is the best choice. Storm energy can also be captured for future magickal use, including charging tools and objects. Here along the Atlantic Coast, the approach of fall signals the beginning of a season embedded within autumn: hurricane season. While we are often spared the category 3 and 4 level storms, we always get multiple weaker ones every year. Last Christmas Day, the wind gusts blowing around my house were over 120 mph. The storm claimed my heavy, large gas BBQ right off the deck. That bout of severe weather ushered in a period of several extremely high wind events. We lost power nine times, including four periods lasting longer than 24 hours. My village was completely flooded with storm surge and many houses suffered extensive damage. We were spared this devastation. What’s a witch to do when she’s chosen to live on an exposed coastal peninsula? Get busy with severe weather protection witchery, of course. Home protection witch jar. Last winter, my previous one was destroyed by the wind. How’s that for you? It still worked. In a storm that ripped siding and roofs off neighbor’s homes, we only lost a couple of shingles. I replaced it with a prosperity jar for our home, property and all of us that now sits proudly in the kitchen window. Included in the jar are bits of the house for sympathetic magick. Charge the pieces with correspondences and an intention to protect the entire object represented by the symbols. You can include pieces of shingles, paint chips, etc. Read my prosperity spell to find out how to make one. Stones and crystals. I’ve used several different ones over the years for various purposes. I had a huge hunk of rough black obsidian named “Rock” (how original, right?) that was our guardian stone when we lived in a densely populated area. He worked very well at absorbing urban miasma and preventing us from getting robbed. Clear quartz is great for all around protection, providing you infuse it with the proper instructions. Most recently, a big piece of purple fluorite was the guardian because of it’s properties of cheerfulness, healing and protection. I liked this fluorite quite a bit. It was a sad day when she was sucked along with the BBQ and smashed to smithereens. Now we have a river rock that stands watch by the front door and various hunks of activated granite. Connect with stones in your area. Ask them if they are up for protecting your home and it’s inhabitants. Storm energy is often felt long before the rain and wind commence. As highly energetic beings, witches, like animals, are often very sensitive to these forces. How you manage them is a personal decision. You may want to shield yourself or revel in it. I don’t endorse weather witchery that attempts to change the direction of a storm for a couple of reasons. First, the energy of a storm is far superior to mine. It would take thousands of witches working in synchronicity to change the course of a storm. I have with my witch squad had some success at momentarily changing a tiny patch of weather or in delaying the onset of it. These large scale social media efforts probably aren’t doing any harm, except that their failure undermines the efficacy of witchcraft as a whole. The issue is that the level of coordination necessary for these spells simply isn’t possible. I’ve got to add that these events often lack any sort of serious witchcraft approach. What they do have is loads of hubris in their belief that a few words or a crystal can change the course of a storm. Continuing with my rant about the best witchy approach to severe weather management, trying to stop severe weather is a form of avoidance coping. Meteorological events are going to happen, just like the personal storms we all experience. Leaning into the nasty weather through preparation and confidence works best in either situation. Read more about accepting the storms of life here. “I protect this home through the power of air, surround us with your protection from the winds that howl.” Use your arm to direct the air around your property, creating a cone of protection all around. “To the earth, I call lend your energy to protection of this home, may the foundation remain intact…” for example. Place copper coins in each corner of your home using the cardinal points and the elements. As you cast using the copper, pour the elemental energy into the coins and then surround your home with it. I always have pennies in the corners. Set out jars (in a secure place) to capture the storm’s energy. Do the same with tools and stones that you want full of the fierce and terrible power of severe weather. I don’t recommend using extreme meteorological events for cleansing objects and tools because they tend to get very purified into super strong Brimo power. You start using something thinking it’s neutralized and then *bam* you’ve manifested a passing thought into reality. I can blame several romantic escapades on having more magick than I could handle. If you are ordered to evacuate, do it. Most shelters take pets. Ensure your protection wards are strong, take what you need and get out. I’ve got to admit that I am not the evacuation type, so don’t do as I do, do as I say. If you are riding out the storm at home, open your cord to your house and land so that you can detect issues as they happen. Maintain your wards from a safe location. “We are protected, strong and safe,” chanted by the entire family while tucked away in a safe zone doesn’t hurt. Envision the words surrounding the house. Keep a tight energetic shield around all of you. Reinforce your wards and shields through reciting incantations, poetry and songs that strengthen your personal and property power. I’ve included one of my favorites below. Remain calm, let the storm’s energy pass through you if possible. See yourself as a conduit between the precipitation and wind and the earth that needs it’s cleansing power. Another confession: I am a storm junkie. I LOVE the power of severe weather. There is absolutely no better spiritual and emotional cleanse/charging possible than standing naked in a storm, soaking it all in. Usually, getting skyclad isn’t sane where I live, so I have to make do with flashing the tempest. I’m not advocating for risky behavior, but it is quite a natural high. If going out into the storm isn’t a viable option, connect with the power by gradually opening up to it, soaking it in and releasing the excess. You can even become a sort of lightning rod directing the energy with enough practice (not recommended for beginners). Even the strongest wards can’t protect against everything. Nature is always going to have her way if she truly wants it. If your property is damaged, petition whatever forces and deities you work with to bless the reparations, especially the financial and insurance aspects. Set up a temporary altar wherever you can and activate those forms on it using what’s on hand. Write sigils on the corners for speedy and successful resolution. Summon acceptance, confidence, patience and resilience however you can. Turn to the elements to release worry and anger. Don’t forget to take a moment to connect with the terrible beauty of destruction. Although severe weather can harm and destroy, it is also a reminder of the energy of nature. 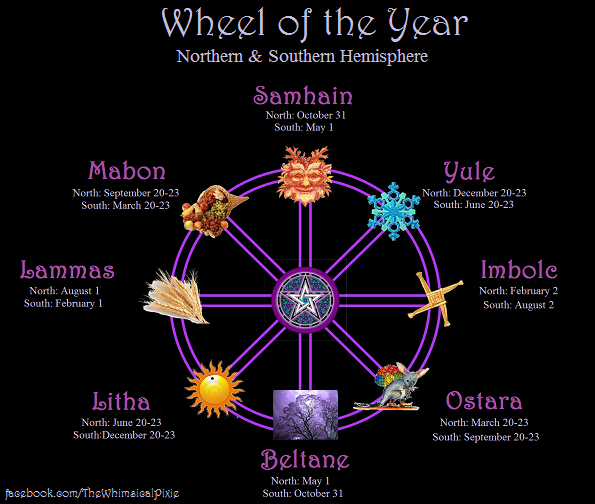 As witches, we work with these forces. There is no better reminder than wading through flood waters or cleaning up what was once your home. I’m not saying this to downplay the devastation, but to illustrate that storms are part of the energetic forces used in witchcraft. Take time to heal emotionally and physically. Support others who suffered losses through practical means and by sending energy. Storm energy can open the gateways to spiritual upgrades, enhanced psychic abilities and increased mystical awareness. It can be difficult to funnel into the right places so it can be saved for later use. Breathe these new gifts into your neural networks and release what your body can’t contain. Cap your jars, wrap your objects and tools to save their storm charge.